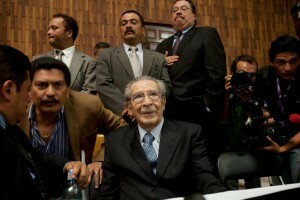 This indelible image captures the moment at the Guatemalan trial of former dictator General Efraín Ríos Montt, when he and his mustachioed legal team are listening to Judge Jasmín Barrios as she pronounces him guilty of commiting genocide and crimes against humanity against the Maya Ixil people, and sentences him to 80 years in prison. They couldn’t believe that the trial had arrived at this historic juncture, ending the long years of impunity to which Ríos Montt had become so accustomed. It was the first time that a former head of state had been tried and convicted of genocide in a domestic justice system. It is a landmark in the annals of the global struggle for human rights, and serves as an example to the world. We filmed the entire trial (of course, how could we not?) from its beginning on March 19, 2013 to its conclusion on May 10, 2013. We encourage you to watch a web series we’ve been posting titled Dictator in the Dock, of dramatic filmed vignettes from the trial. We will eventually release a film of this trial as part of a trilogy that began with When the Mountains Tremble in 1982, and continued withGranito: How to Nail a Dictator in 2011 – and now with the Ríos Montt conviction we have concluded a 31-year story arc! There could hardly be a better example of Martin Luther King’s famous words, “The arc of history is long, but it bends toward justice.” With our broadcast partner P.O.V. we have made both films available to be streamed online from now through May 24 – to view the films in English or Spanish click here. Since the verdict, activity has spiked at Granito: Every Memory Matters, the project we launched with our Guatemalan partners to restore the collective memory of the Guatemalan genocide. It seems that the triumph of justice over impunity is emboldening more victims and their families to come forward to share their stories. For an excellent account of the dramatic last day when the verdict came down, go to the Open Society Justice Initiative blog of the trial.